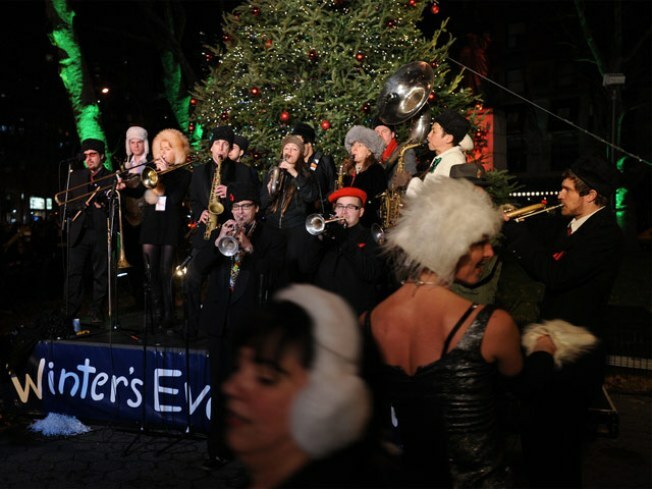 The Eleventh Annual Winter’s Eve at Lincoln Square is on tonight. YULEPALOOZA: The Eleventh Annual Winter’s Eve at Lincoln Square bills itself as New York City’s largest holiday festival. There’ll be a tree lighting, food tastings (chocolate bouchon from Bouchon Bakery? yes please! ), discounts and more: Shops and services from 63rd street along Broadway to the Time Warner Center will overflow with special holiday activities as the streets come alive with street musicians, jugglers, stilt-walkers and more. Rain or shine, 5:30PM. TWO BY TWO: Even if jazz improv isn’t your thing, prepare to be swept along on a musical adventure as 20 performers duet in sequence, tapping in one musician after the other to create a relay race of sorts of fully improvised music. Bassist Ben Allison and trumpet player Avishai Cohen are among those on the bill at (Le) Poisson Rouge for A Night of Round Robin Improvised Duets to Benefit Search and Restore, a non-profit dedicated to expanding the audience for new jazz in NYC and beyond. 10PM @ (Le) Poisson Rouge. MILESTONE: Zagat Wine and Hugh Johnson, the world’s best-selling wine writer, prepare to host you inside Bayard’s, the historic colonial mansion in the Financial District, to celebrate Zagat Wine’s first anniversary. Sample 24 specially selected wines and nibble on paired hors d’oeuvres as the Thanksgiving weekend’s indulgence stretches clear through to Monday. 6:30PM.